The CoolSculpting® procedure is FDA-cleared for the treatment of visible fat bulges in several areas of the body, including abdomen, flank, thigh, submental area, underneath the buttock, upper arm, bra fat and back fat. CoolSculpting® uses controlled cooling to target and crystallize fat cells. The CoolSculpting® fat freezing procedure is completely non-surgical, so you can typically return to normal activities immediately. One of the best things about Coolsculpting® is that the recovery time is minimal with no downtime! Patients are free to return to normal activity or go to the gym immediately after treatment. While there will be a sense of numbness in the treated area, this will resolve predictably in about 2 to 4 weeks. There is sometime a small bruise caused by the suction, resembling a hickey, but most commonly there is no bruise at all, and the pinkness of the skin caused by the cold resolves fully in a matter of hours. This is truly a procedure that can be “squeezed” into a busy schedule and does not need to interfere with other aspects of one’s life. The cost of treatment corresponds directly to the amount of treatment desired. The Facial Rejuvenation FL complementary body contouring consultation will come with a customized treatment plan. Treatments are charged based on the number of applicator placements. The small applicator area treatment cost is $700 per area, The large paddle area treatment cost is $1,400 per area and the blue Flat Paddle is $850 per area. The applicators are on the body for one hour of computer-controlled cooling, followed by a 2-minute massage. For optimal results, we typically recommend 2 to 3 treatments of any given area, spaced 4 to 8 weeks apart. Package pricing for a series of treatments results in very significant cost savings. Patients who are interested in the most dramatic results will typically schedule 2 to 3 hours of treatment at a time. Facial Rejuvenation FL is also proud to be the first practice in the northeastern United States to introduce the CoolSmooth applicator. 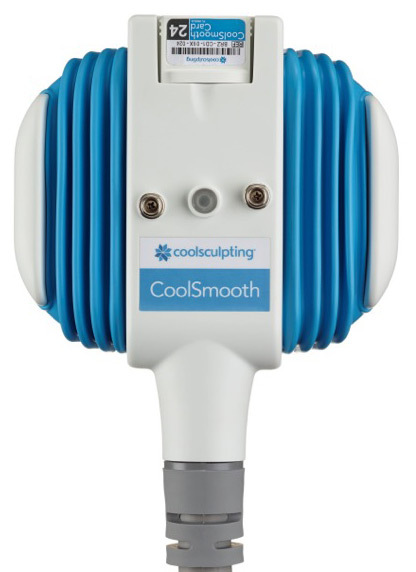 This applicator represents an enormous advancement in Coolsculpting® technology, because unlike the other applicators, which must grab the tissue and hold it inside, the CoolSmooth simply rests on the area to be treated. This allows outer thighs to be treated, as well as other fatty bulges which may not be adequately pinchable for the traditional applicator. Best of all, we have TWO CoolSmooth applicators, so we can treat two spots at once! Once the treated fat cells are crystallized (frozen), they die and are naturally processed and reduce from the body. To date there are no long term negative effects of CoolSculpting®. The reason it only damages fat cells is that fat cells will freeze at higher temperature than other tissues. The reason the other tissues such as skin, nerves and blood vessels are not frozen at these same temperatures are that they are water based. The device carefully controls the cooling process so that the temperatures achieved are such that the only the fat will freeze but are above the freezing point of other tissues inside the applicator. 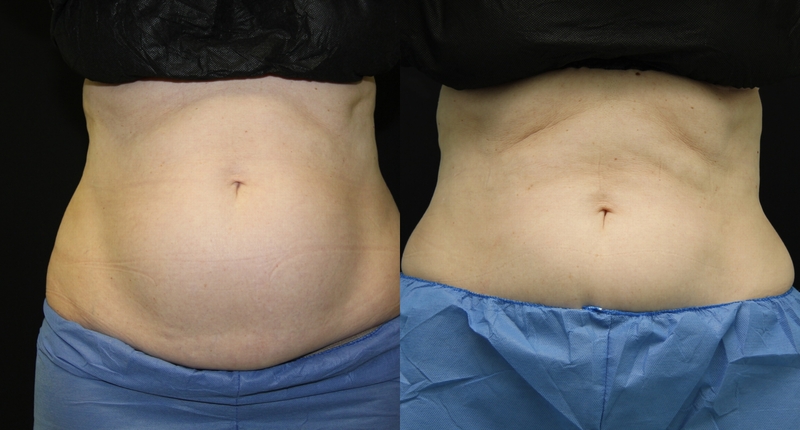 The CoolSculpting® procedure is FDA-cleared for the flank (love handles), abdomen and thigh. During the procedure you may experience deep pulling, tugging, pinching, numbness or discomfort. Following the procedure, typical side effects include temporary numbness, redness, swelling, bruising, firmness, tingling, stinging and pain. Rare side effects may also occur. The CoolSculpting® procedure is not for everyone. You should not have the CoolSculpting® procedure if you suffer from cryoglobulinemia or paroxysmal cold hemoglobinuria. The CoolSculpting® procedure is not a treatment for obesity. 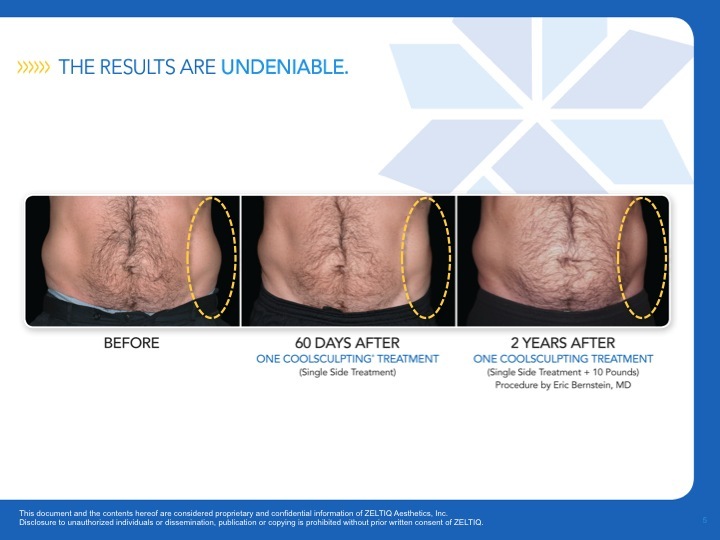 As with any medical procedure, ask your physician if the CoolSculpting® procedure is right for you.